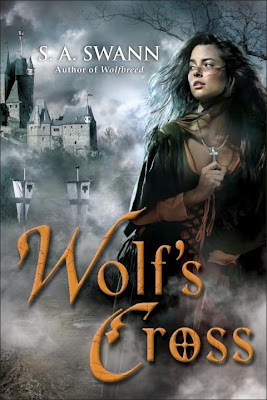 I came across this delicious cover for Wolf's Cross by S.A. Swann, the followup to last August's Wolfbreed. This historical paranormal will release July 27. Maria lives a simple life in a small Polish village, working for the lord of the nearby fortress. Motherless since her birth, Maria has been raised by her father and stepmother. Around her neck she wears—as she has always worn—a silver crucifix: to protect her from the Devil. Or so her father tells her. But when a contingent of badly mauled Teutonic Knights, including a handsome and gravely wounded young man named Josef, ask for succor at the fortress, Maria’s quiet and comfortable world shatters. For the knights are Wolfjägers, an order dedicated to the extermination of werewolves. And Maria, unknown to her, is one of the creatures they hunt. Only the crucifix about her neck prevents her body from changing into a lethal killing machine. When Maria meets Darien, a wolfbreed bent on exacting a terrible revenge on humans, she will learn the truth about herself. And find her loyalties–and her heart–torn in two. What a great cover! Made me want to check out Wolfbreed. Yes, very nice cover art! I agree, great cover! I want to read it! I love that cover, and the story definitely sounds interesting! 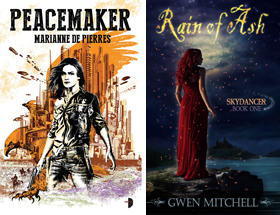 The author lucked out with the covers on both novels - they're really, really nice. I hope to read the first one sometime soon. Thanks for posting this! I think everyone agrees this is a standout cover, even better than the first in the series. I will have to add both books to my wishlist.